Classical architecture can never be too rich or too big. Especially if it is a public library. We see great library buildings in cities and local communities around the world. These are inspiring spaces in which to learn, and they are impressive. The former Chicago Public Library is now the Chicago Cultural Center. The library was established in 1872, a year after the Great Fire of 1871 destroyed the City’s collection of 30,000 books. By 1891, through donations and the City’s determined efforts to recover, the collection reached 120,000 volumes. In anticipation of the upcoming Colombian World’s Exposition in 1893, and the world attention the city would receive, the City Council determined that Chicago should have a grand public building for its growing collection. The library building was also to include a the Republic Memorial Hall, a Civil War memorial, with separated entrance. For both purposes, the architecture fits. The Boston-based architectural firm of Shepley, Rutan, and Coolidge, who had also designed the Art Institute of Chicago, were retained to design the library. 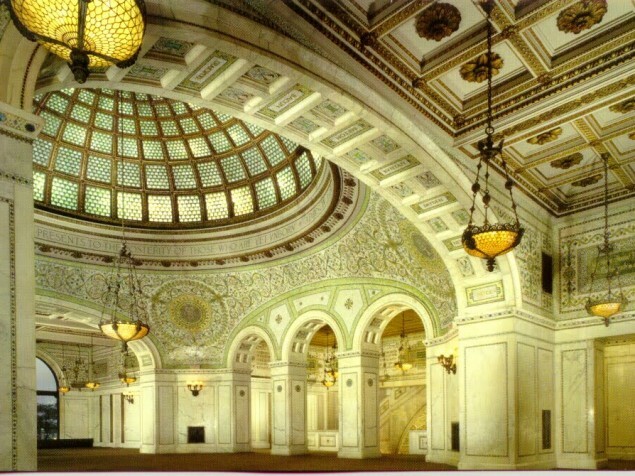 It was to be a carefully proportioned and finely-detailed Neoclassic building with all the aesthetic “bells and whistles.” It was to reflect the spirit of Chicago. Construction of this monument to the City was completed in 1897. By the 20th century, the Chicago Library’s collection again outgrew its space. The library building was almost demolished in the early 1970s, and in 1972 Mayor Richard Daley’s wife Eleanor made a public plea, “I am for restoring and keeping all the beautiful buildings.” And that was that. That same year the building was placed in the National Register of Historic Places. 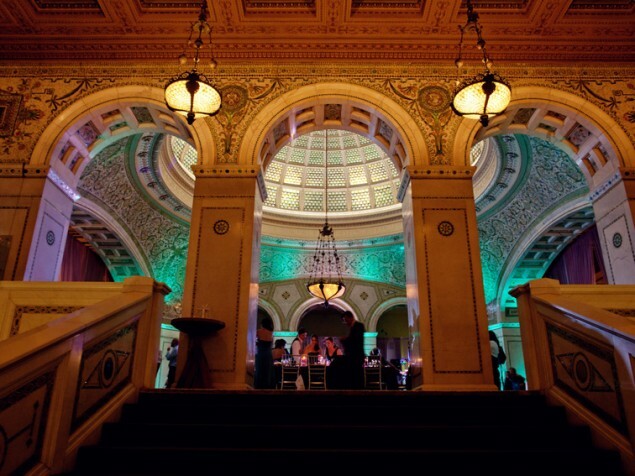 The City hired acclaimed Chicago architects Holabird and Root to perform the historically sensitive renovations, and In 1976 the building was designated a Chicago Landmark. 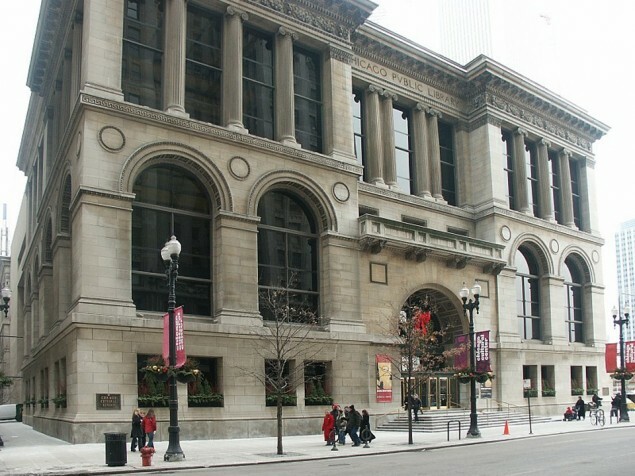 A separate, new library building was constructed in 1991, and the former Chicago Library was renamed the Chicago Cultural Center. 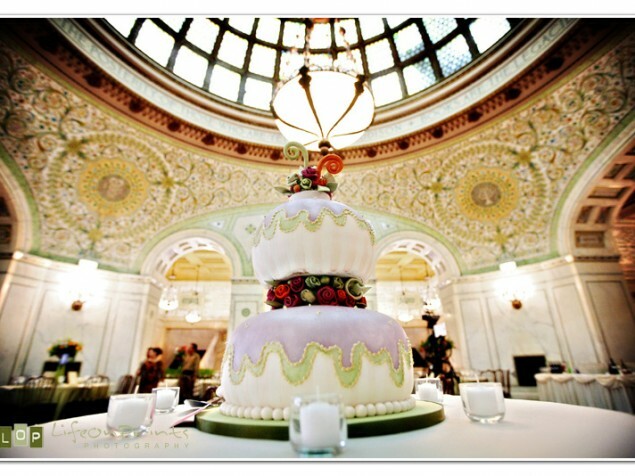 The Chicago Cultural Center offers a variety of classic historical venues for weddings and social events, corporate launches, and performances. 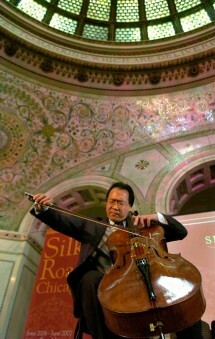 These spaces are located in both the former Chicago Library and the Republic Memorial Hall. Dramatic spaces of the library section include its grand lobby and the Preston Bradley Hall. The lobby features Italian and Irish marble and bronze. From there a grand staircase draws your attention through a series of arches to the beautiful Preston Bradley Hall. 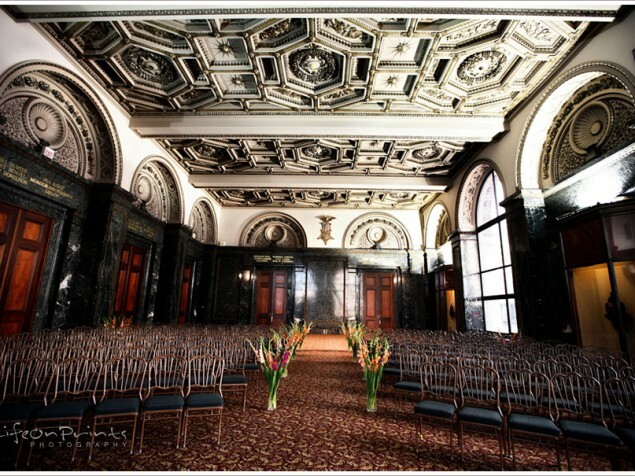 The Preston Bradley Hall is grand space and ideal for weddings and important life events, performances, and exhibitions. Interior walls and arches throughout these spaces are covered with intricate mosaics of marble, stained glass and gold leaf. The most dramatic feature is its 38- foot Tiffany stained-glass domed skylight, the world’s largest dome to contain Tiffany glass. The dome is now lighted to better accommodate evening events. Features of the Republic Memorial Hall include the Grand Army of the Republic Rotunda, decorated with military-inspired heraldry of carved plaster. 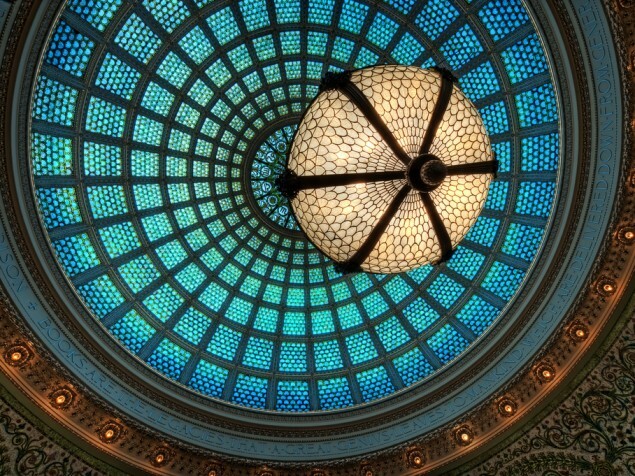 The cast iron and stained-glass dome in this location was produced by local firm of Healy & Millet. This dome is also now electrified. Beyond the Rotunda is the G.A.R. Memorial Hall whose decorations honor the Civil War veterans..
Appropriately identified as the “People’s Palace”, this Chicago architectural landmark has a truly grand presence. It reflects the great pride of the city, and it is a fitting tribute to the people who conceived it, and later who saved it. Hosting an event in any of these spaces would enable those present to experience both its extraordinary beauty and the intangible qualities that make the Chicago Cultural Center a special place in the city's history.